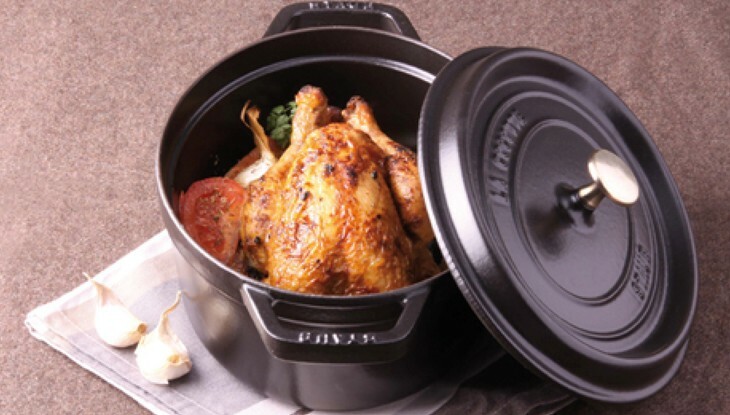 Sear all the sides of the chicken or poultry pieces in the Cocotte on a medium heat in 2 tbsp. olive oil until it is golden brown. Add the garlic crushed with the garlic press and then add the honey. Sear for about one minute and turn the meat so that it is totally covered with the honey. Add the Soy sauce and season with the four-spice mixture and pepper. Simmer for about 25 minutes on a medium heat. Season to taste (Soy sauce is salty by its very nature) and add extra salt depending on your taste. The same recipe can also be prepared with the five-spice mixture (Sichuan pepper, cinnamon, fennel, cloves and star anise). The cooking time can be reduced as Soy sauce caramelizes quickly.